Beatles Maple Leaf Gardens, Toronto, September 7, 1964 Press Box Concert Ticket. The Fab Four played two shows on the 7th, blasting through a 12-song set. The ticket measures 3.75" x 1.25" and is slabbed in acrylic to an overall size of 6" x 3". There is a small heart-shaped cancellation on the edge of the right margin. Fine condition. 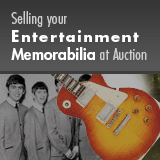 The Connie and Dennis Dailey Monumental Beatles Collection.